The Roman Theatre of Verulamium is unique. Built in about 140AD it is the only example of its kind in Britain, being a theatre with a stage rather than an Amphitheatre. Initially, the arena would have been used for anything from religious processions and dancing, to wrestling, armed combat and wild beast shows. 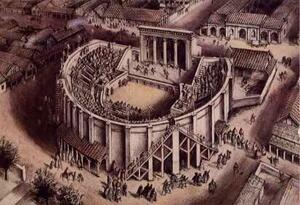 From about 180AD the stage came into greater use and the auditorium was extended. By about 300AD, after some redevelopment work, the Theatre could seat 2000 spectators. The ruins one can see today were unearthed in 1847 and 1935. Subsequent excavations in 1957 and 1961 revealed a row of shop foundations, a Roman Villa and a secret shrine, all thought to date from the First Century. The theatre has been refurbished in 2014 to include new steps, pathways and handrails. There is now improved, yet limited disabled access. The Theatre is available to book for cultural entertainment. It is also possible to view treasures evacuated from the Roman Theatre site at the St Albans Verulamium Museum. Please note that opening is dependent on weather conditions, the Theatre may close in adverse weather conditions. School groups are very welcome. There is limited parking available at the site. Further parking is available outside the St Albans Verulamium Museum where you can also view treasures excavated from the Roman Theatre site.